Travis Head hits out as he top-scores for Yorkshire with 53 in their defeat to Warwickshire (Picture: Allan McKenzie/SWpix.com). AFTER his side beat Notts at Scarborough last Wednesday, Alex Lees, the Yorkshire captain, admitted “it would be hard for us not to qualify now in the 50 overs”. Yorkshire’s fourth successive victory had taken them two points clear at the top of the North Group, leaving them with one foot firmly in the quarter-finals with two games left. So hard was it for Yorkshire not to qualify, indeed, that they ended up doing so last night despite losing those last two matches. After a 15-run defeat to Durham, Yorkshire lost by 114 runs to Warwickshire under the Duckworth-Lewis method, but it was not enough to prevent them from reaching the knock-out stages for a second successive year. If there was no harm done overall, with Yorkshire completing a limited-overs double after booking their NatWest T20 Blast quarter-final place last Friday, there was a setback in that they ended the group stage in third position. Consequently, instead of having a home quarter-final for finishing in the top two, Yorkshire will be away from home for a tie that will be played on August 17 or 18. The final games in the South Group take place today, with Yorkshire playing the side that finishes second. As things stand, that could be any of Somerset, Essex, Hampshire, Kent, Middlesex or Surrey. In cloudy conditions yesterday, with 4,092 turning out on Yorkshire Day, Warwickshire scored 283-6 after winning the toss. Jonathan Trott, the former England batsman, top-scored with 118 from 135 balls, his 19th one-day hundred, and Laurie Evans hit an unbeaten 48 from 30. 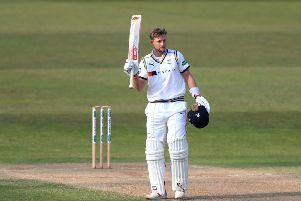 In reply, Yorkshire, who rested Tim Bresnan and recalled fellow all-rounder Will Rhodes, were dismissed for 167, Travis Head top-scoring with 53 from 63 with five fours. Ateeq Javid, the 24-year-old off-spinner, took a one-day career-best 4-42, with Yorkshire falling 22 short of the 189 that would have secured a home quarter-final even in defeat. After light rain delayed the start by 15 minutes, David Willey and Steve Patterson performed well with the new ball. Warwickshire had put only 16 on the board when Will Porterfield was first out in the eighth over, victim of a tumbling catch at mid-wicket by Liam Plunkett off Patterson. Patterson conceded only 18 from his first six overs, while Willey leaked only five runs from his first five. The visitors suffered another setback when Sam Hain fell with the total on 40, flicking at Plunkett’s fifth delivery and edging to wicketkeeper Andy Hodd. Trott has been in prime form recently, and he showed all his experience to steady the ship with Ian Bell. Trott seemed in no trouble as he progressed to a 61-ball half-century, the sort of innings when you suddenly look up and see that a batsman has 50 to his name. Bell looked in no trouble either before giving it away somewhat as Warwickshire fell to 92-3 in the 23rd. The ex-England man drove Plunkett to Willey at cover, ending a stand of 52 with Trott in 10.1 overs. Warwickshire, 103-3 at halfway, might have slipped to 120-4 in the 30th, but Tim Ambrose was given a life by Karl Carver running in from deep square-leg after the batsman swept Azeem Rafiq. It was by no means an easy chance, but it was one that the young spinner would have been disappointed not to take having got to the ball. At the other end, Trott carried on in trademark manner, eschewing risk and working the ball around sensibly. He reached his hundred from 122 balls with nine fours, celebrating in the refreshingly understated fashion of someone used to making big scores. Rafiq finally got Ambrose caught at long-on, ending a stand of 93 with Trott in 19 overs, and Trott fell four overs out when he was caught at deep square-leg by Jack Leaning off Patterson. Rikki Clarke perished to a disputed catch at long-off by Adam Lyth off Rafiq, amid confusion as to whether the ball bounced just in front of the fielder, and the visitors were indebted to Evans’s late flurry, which included three fours and two sixes. Patterson, Rafiq and Plunkett each took two wickets, but Yorkshire conceded 104 from the last 10 overs. Nor was their fielding at its sharpest, a reflection, perhaps, of recent workload. Yorkshire lost two wickets inside the first six overs of their reply, Lyth superbly caught by a diving Evans at slip and Lees run-out after a mix-up with Willey. Willey went lbw to spinner Javid after a short rain delay, which reduced Yorkshire’s target slightly to 282 from 49 overs. They fell to 79-4 in the 17th when Leaning swept Javid to deep mid-wicket, and to 120-5 when Rhodes lobbed Javid to mid-off. Javid claimed his fourth wicket when he bowled Head playing back, fellow spinner Jeetan Patel pinning Hodd to leave Yorkshire 143-7. Recordo Gordon trapped Rafiq for a duck, Patel had Plunkett stumped, and then he bowled Patterson to round things off.